The centrally-located and elegant 30-story Manhattan hotel makes a contemporary statement in limestone and glass, just a stone’s throw from Fifth Avenue. Guests can choose from 398 spacious rooms on 30 floors- including 52 suites and one presidential suite- all featuring Sofitel's luxurious feather top and duvet sleep system - SoBed. All rooms are decorated in an elegant, Art-Deco style with zebra-print chairs. Beds are topped with high thread-count sheets, and down pillows and duvets. King-size bed accessible rooms are available, as well as refrigerators, coffee makers and baby cots upon request. 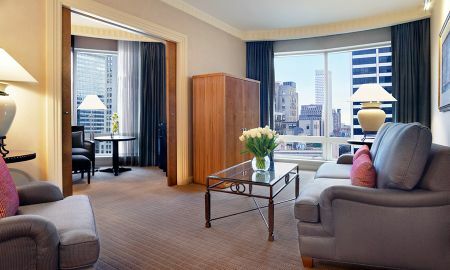 Sofitel New York offers 52 spacious Manhattan hotel suites with stunning city views. Guests can enjoy spacious accommodation, including separate living rooms, in a convenient location near Fifth Avenue, Central Park, and Times Square. Some suites feature terraces. 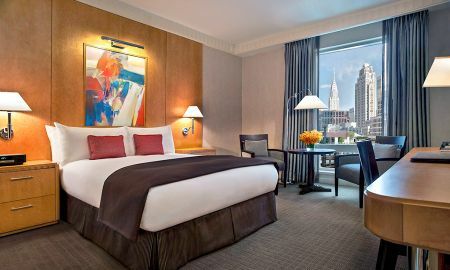 Guests can enjoy the modern amenities of this sophisticated downtown NYC hotel, within easy reach of Manhattan's most celebrated attractions. The elegant midtown hotel offers a unique dining experience at Gaby, which serves French flair in a stylish setting. 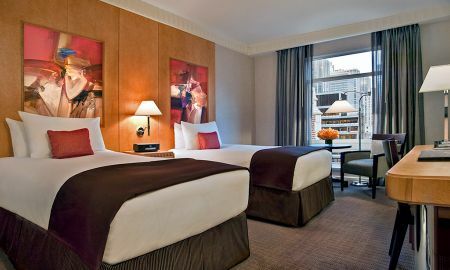 Sofitel New York is situated opportunely near the Rockefeller Center, Times Square, Broadway theatres, world-famous restaurants, art museums, and corporate headquarters.